Well, here it is Friday, the end of the work week for some, not for me. My week is just starting. My next 2 days off are Wednesday and Thursday. And, after that I will get to work 6 days without a break. Next Wednesday I get my car inspected. Yippee. The dealer I use, Brenner Motors, has their service set up a la carte - you get to pick what you need done... and the price is listed. After you're finished choosing, everything is totaled, including the sales tax. Nice feature. You know what you're going to be charged before you even hand them your keys. Odd thing: Night before last I dreamed I was going back to Singapore and this stupid woman put this stickers on my luggage that were very expensive so I made her take them off. Then, of course, we find out that the Idiot Jerk is going to be meeting with Kim in... Singapore. Implications? This is the first time in America's history that a sitting president has sat down with a dictator who, just a few years ago, fed his uncle to dogs. Remember that? Well, maybe he didn't actually feed him to hungry dogs. Nah, he just called him a traitor and had him shot to death. Of course, Republicans and jumping up and down shouting with joy and Evangelicals feel the 2nd Coming is near... all for naught. North Korea is not going to give up its nuclear program. Concessions made might be symbolic at best, nothing more. They realize they are dealing with a Fool who thinks he's a player, who thinks he's shrewd. The sad truth is all they need to do is tell him what he wants to hear, lie to him the way he lies to everybody else, and he'll be happy. There will be no real accomplishments when this summit is over. In the end, this will be nothing more than a happy photo op, the sort of phony thing the Idiot Jerk lives for, that will make him in his own mind special. This whole thing is nothing more than a half baked scheme to improve his image, nothing more. My bread is baked. Wheat. I've never baked whole wheat bread before. Very dense. As you can see, I don't use bread pans. I have them, I just happen to like the crust a little more chewy. 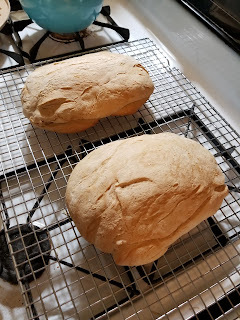 I bake bread for eating, not for sandwiches. Being perfectly honest, I'm not a big sandwich person. Unlike the Idiot Jerk in the White House, I like things fully baked, not inconsistent and half raw. Love the expensive sticker nightmare and that bread looks delicious. It is rather tasty, though I should have let it rise a little longer. That bread does look good! I LOVE bread. Abn Kim Jong Un will be playing _____ like a fool. Kim sure will, he knows an old fool when he sees one. this whole meeting is nothing more than a "who's got the biggus dickus" comparison. full of sound and fury, signifying nothing (to quote old billy shakespeare). I do believe the Bigus Dicks us Money Python and 'the sound and the fury' Faulkner, and the bread is... delish.